Services – Alpha Southwest, Inc.
Alpha Southwest (ASW) service capabilities include, application engineering, VFD selection and integration, pump & valve repair, fabrication services, onsite services, and well rehabilitation. Alpha Southwest (ASW) provides consulting engineers support for pump selection and design, valve selection, pipe fabrication feasibility and surge analysis. ASW routinely prepares shop and machining drawings for the manufacture of discharge heads, suction and discharge/suction headers, surge arrestors, duplex & triplex pumping skids and pump cans. Alpha Southwest’s (ASW) team of factory trained and authorized service technicians are available to troubleshoot, repair, start-up and install drives and industrial control systems. The ASW team is available to assist and consult in VFD selection. ASW understands how to match the VFD to the driven load. ASW’s can fabricate, build, and machine or repair discharge heads, top shafts, impellers, flanged column pipe, bowl unit wear rings, impeller wear rings, build new pump unit bearings, build new shaft sleeves, fabricated suction cans, fabricate suction & discharge piping, straighten shafting, and rebuild just about any type of horizontal pump, storm water, submersible and vertical turbine pump top to bottom. 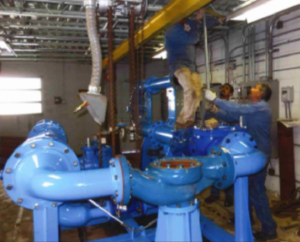 ASW specializes in rebuilding, servicing, repairing and maintaining of pumps, regardless of size, type, or manufacturer. Most pumps can be rebuilt to as new condition. Often simple retrofits can extend life and improve performance. ASW should be your preferred pump specialist. Our vast pump experience and know-how encompasses many types and styles of pumps. ASW routinely rebuilds and repairs all types, styles, and sizes of valves, actuators, and gear drives. Our experienced field mechanics are able to rebuild and re-machine valves inline up to 60" diameter. Our full service machine shop is equipped to manufacture or modify any valve component from any grade of material. All components are 100% dimensionally inspected and certified. ASW will assess the pump and motor condition and will suggest maintenance, repairs or replacement. This inspection also includes electrical tests for shorts to ground and continuity of the motor windings. In addition, all above ground components are evaluated. This is followed by a color video inspection. Utilizing our advanced down hole view camera and side view 360⁰ color view video camera, ASW can identify well plugging problems, well failures, and well case integrity issues. The inspection captures a highly detailed full color video to depths of 1,500 feet. Our inspection system can detect cracks or holes in well casings, plugged or offset perforations, deformed casings, improper gravel packing, bacterial buildup and mineral incrustation. Utilizing the pump & motor assessment and the video inspection ASW can then diagnose well problems and prioritize them in a Custom Designed Rehabilitation Plan.